b – have the time for it… the 05.15 alarm and commutes does take it’s toll. As a result, I chose to go down the ‘cheap’ Chinese light route, on the basis that these would be dispoable if the night-riding theory didn’t work. 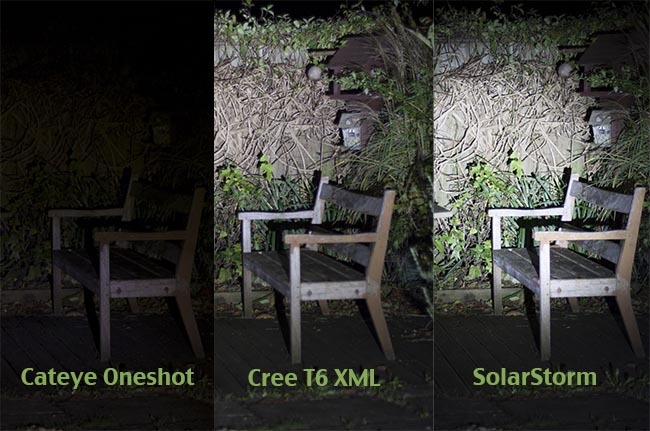 Unfortunately the SolarStorm didn’t arrive, so having chased for refund, I ordered a Cree XML T6 from a UK supplier for £20, which arrived safely a few days later. To my surprise, the SolarStorm then arrived at our local Post Office two weeks later… so I have two lights to compare. First impression in the garden showed the SolarStorm outgunning the XML T6, but the reality on the trail was slightly different. I took Louis out for a spin last Wedensday night (4th Dec 2013 – under an almost perfect pitch-black new moon) and it was the Cree XML T6, the single lens light, that seemed to work better. The SolarStorm has a good spread and throws light down the trail well, but much of that is ‘lost’ to the sides, where it probably doesn’t matter. The XML T6 in contrast throws a strong beam down the singletrack and gives a clear view of the way ahead. 2 – I’m going to do a spin shortly on my own and will mount the SolarStorm on the bike, to give a good spread, and put the Cree XML T6 on my helmet to light up exactly where I’m looking. We have a short video of our experiences HERE. Final note – these lights do dazzle oncoming drivers, so use them responsibly. At one point, Louis and I were riding side-by-side and an oncoming car pull over as it assuming we were another car… and we had one car flash us to ‘dip’ our lights. Update 29th October 2014 – I’ve just bought a higher capacity battery for the SolarStorm and forst impression are good, with much extended burn times. This should make the SolarStorm a practical option for extended trail rides now.